From the front it looks like a classic limousine. But a glance at the back shows this Rolls-Royce has a distinctly sporty flavour to it. This is the world's most exclusive convertible - the British-built Phantom Drophead Coupe. Launched today, with a £305,000 price tag, it is aimed at super-rich romantics looking to inject more excitement into their lives. The Daily Mail was the first behind the wheel of this astonishing vehicle, which is a key part of Rolls-Royce's plans to double production and create hundreds of jobs. Inspired by convertibles of the 1920s and 30s, the two- door, four-seater supposedly aspires to capture the allure of an "elegant motor yacht at speed". The nautical feel is reinforced with teak decking from more than 30 pieces of solid wood covering the rear hood stowage. It has the largest hood of any modern convertible - five layers of tailored fabric insulation, lined with a cashmere blend of material to dampen sounds. The rear of the boot even drops down to form a picnic table and seat for two adults. Despite weighing three tons, the car can be propelled by its 6.75-litre V12 engine from 0 to 62mph in only 5.9 seconds. Nevertheless, the engine is so quiet that when it idles it is drowned out by birdsong. But the car is hardly environmentally-friendly, managing only 17 miles to the gallon. The six-speed car develops 453-brake horse-power - about the same as five Ford Fiestas. However, the top speed is being electronically limited to 149mph on 20-inch standard wheels. The car has the traditional flourishes of craftsmanship, including a smaller but more detailed Spirit of Ecstasy or 'Flying Lady' mascot. Inside, the driver's hands touch only chrome, leather or wood. For those little 'extras', a wood veneer fridge in the boot is £6,500, having your initials stitched into the headrests or carved on to the wood panelling or tread plates is about £1,000 a time, while special two-tone paint will add another £6,500. Rolls-Royce has calculated that there are 85,400 people in the world who have the necessary disposable income to buy their cars. The company-aims to do business with 1 per cent of them every year. Half of the Drophead's customers will already own a Rolls-Royce. These include the likes of music mogul Simon Cowell, businessman Sir Alan Sugar and singer Jennifer Lopez. 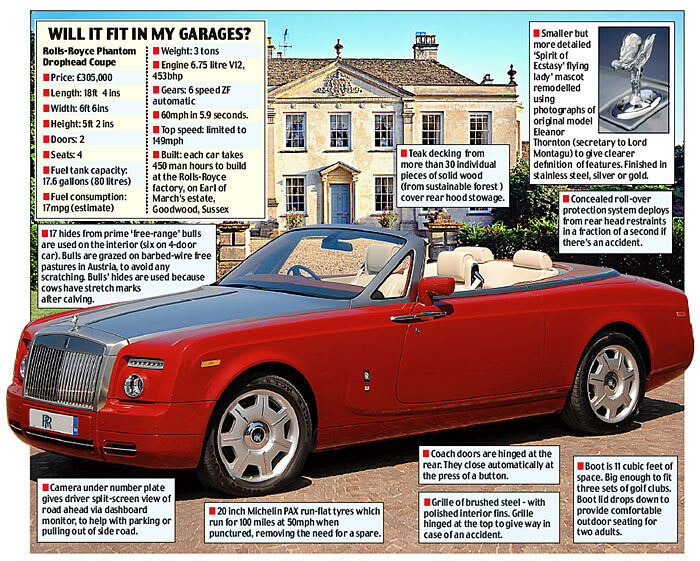 Typically, Rolls's customers are predominantly self-made men and entrepreneurs, who own three to five properties around the world and have between five and eight cars in their garages. One American bid £1million in an auction to be the first U.S. customer. Rolls-Royce's chairman and chief executive Ian Robertson said: 'Our customers are impervious to traditional marketing. "Typically they have between £15million and £20million of disposable income but are extraordinarily keen on getting value for money. "They like to be seen to be taking the right decision. They expect and demand the best." The first order goes on the production line from Monday for delivery in July. However, anyone putting in an order today will have to wait until the end of next year for delivery. Since 2003, Rolls-Royce has been owned by German car giant BMW. More than 3,000 vehicles have so far been built at its new factory, on the Earl of March's estate at Goodwood in Sussex. The company plans to increase production from 800 to around 2,000 cars a year within four years, while the 600-strong workforce will rise to 1,000. Also in the pipeline is a sleek coupe and a 'baby' Rolls-Royce priced at between £160,000 and £200,000. That is some severe luxury! Whew! I was scared to open this thread with DROP-DEAD in the title! Eh...I'm not much of a fan of the Rolls style. The front end looks like a truck, and those headlights are horrendous. I'll stick with a Bentley GT Convertible. I saw that in person at a car show and I must say, I am not a fan. . It is huge. It is very wide. I would rather have a sports car. I certainly would not complain if I had this car. I don't care for the style of the front end, especially the contrasting metallic hood. It's a little much.